Many of our patients first make an appointment with us at West Omaha Chiropractic & Sports Injury Clinic because they are suffering some form of neck pain. Neck pain can range from the mildly uncomfortable to severe. In severe cases of whiplash, the neck may even become immobile. 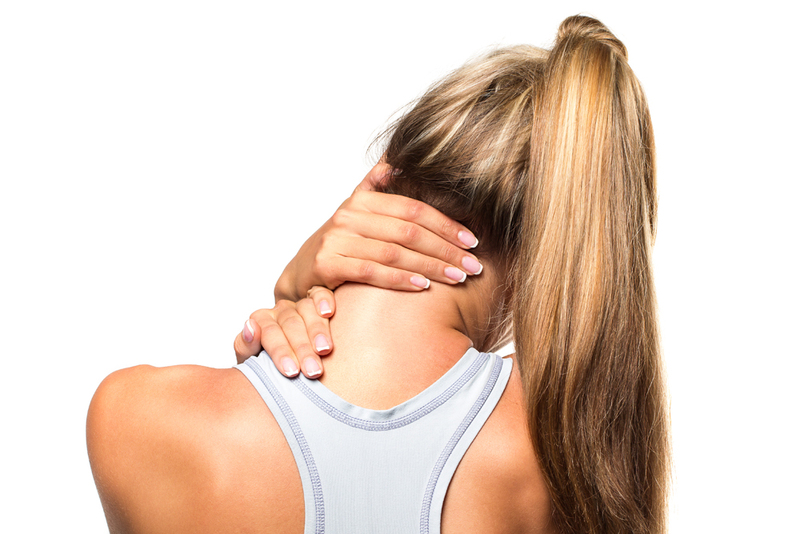 What are the various causes of neck pain? How can it best be treated and why should you make an appointment for your neck pain at West Omaha Chiropractic? There are four general causes of neck pain. Trauma. This is any outside force that causes neck pain such as an auto accident, fall, or sports injury. A whiplash is a form of a traumatic neck injury. Illness. A variety of illnesses can cause neck pain such as arthritis, infections, and cancer. Lifestyle. How you conduct your life can affect neck pain. Use of personal electronic devices, diet, fitness, poor posture and ergonomics at work can all contribute to neck pain. Age and Degeneration. As we get older, the soft cushioning material between the bones in the neck can deteriorate creating pinched nerves causing neck pain. In any of these instances, it can be important to seek the help of a professional. While many treat neck pain with medication, pain killers simply mask pain. They don't address the core cause of the pain. At West Omaha Chiropractic, we diagnose the root cause of your discomfort. We then seek to resolve the pain through a series of all natural chiropractic adjustments, massage therapy, and even acupuncture to realign the neck and back and relieve pain. Once in proper balance, the body can help heal itself and restore wellness while managing pain. The result is long-term freedom from neck pain without the use of drugs or surgical procedures. Why Choose West Omaha Chiropractic for your Neck Pain? Our team of dedicated chiropractors and caring staff are committed to your health. Dr. Trevor Wagner, Dr. Julie Owen-Wagner, and Dr. Ron Evans have been helping patients recover from neck pain and other maladies for over 20 years. Not only do we diagnose and treat your neck pain, but we can offer fitness and nutritional advice to help you maintain a healthier lifestyle. We offer traditional chiropractic care along with modern technologies like K-Laser. If you are experiencing neck or back pain, contact us for an appointment. ContactWest Omaha Chiropractic & Sports Injury Clinic for an appointment today at (402) 334-4700. Ask about getting a free initial consultation to learn how chiropractic care can help you live a life of wellness. Our offices are located 2639 South 159th Plaza in Omaha, NE. No matter what your health goals are, our goal is to offer you the finest care possible. It's up to you to decide how much of it you want. The causes of neck pain are quite diverse, largely due to the central role the neck plays in just about everything we do throughout our day. Fortunately, at our chiropractic office, we provide treatment to bring neck pain relief regardless of the underlying cause of the symptoms. The following are answers to some of the most common questions we receive from our patients with neck pain. The cause of neck pain can be something as simple a sleeping in the wrong position or something as dramatic as a car accident. In fact, one of the most common injuries we treat is whiplash, which describes a collection of symptoms caused by the rapid snapping of the head and neck back and forth as often happens during a motor vehicle collision. Other causes of neck pain are not as dramatic but still can lead to significant symptoms. Text Neck is a good example of this, and it’s a condition that's on the rise lately as we all spend more and more time looking down at a smartphone day in and day out. In fact, any activity that causes you to hold your neck in an awkward position for a period of time, or that involves certain types of repetitive movements, can cause symptoms requiring neck pain treatment. How Does Chiropractic Neck Pain Treatment Work? Our chiropractic neck pain treatment focuses on restoring proper alignment of the cervical vertebrae so that they are not causing impingement of any nerves roots exiting the spinal column. We also direct significant attention to reducing inflammation of the surrounding soft tissues, and our goal in this is to help support the body’s natural healing processes by ensuring that those damaged tissues have what they need to repair themselves properly. Our neck pain treatment programs typically involve stretches and exercises to do on your own to build strength and range of motion in the neck. Depending on the cause of the symptoms, we may also provide some advice on how to modify your workstation or daily routine so that symptoms are less likely to return. When Should I Visit a Chiropractor for Neck Pain Relief? There’s never a bad time to visit our Omaha chiropractor for neck pain relief. In fact, the sooner you come in, the better your chances are of achieving a full and speedy recovery, particularly if you’re dealing with injuries sustained in a car accident. To learn more or to take advantage of our new client special, call our office in Omaha today at (402) 334-4700.